The group photograph was taken in the playground of Tweeddale School in July 1943. 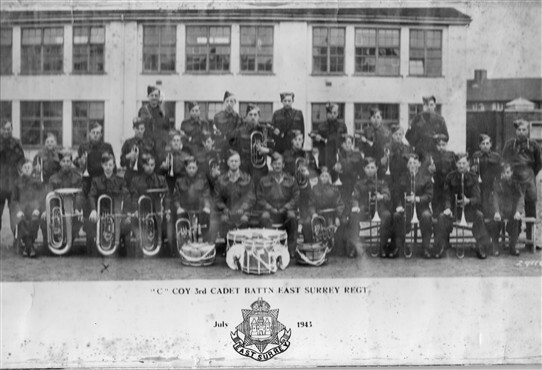 Gordon Jones was a member of the Army Cadet Band and he played the Eb Bass.He is in the front row 3rd from the left. The two officers in the front row are the Bandmaster on the left and the C.O.of the company Captain Fowler. All the instruments for the band were provided by the Captain and it must have cost him a small fortune. The cornet player 3rd from the right in the second row was Norman Madden. He went on to join the Irish Guards and in the 1950's toured with the Irish Guards Band in Australia. Other members were Denis Marchant 4th from left 2nd row, James Bubb 4th from the right 2nd row, both also cornet players and Ron Cawdell a trombone player who was in the front row 2nd from the right. The other photo is of 17 year old Gordon standing at the rear of the back garden of 72 Wendling Road looking out over the air raid shelter in the garden of number 6 Whitby Road. 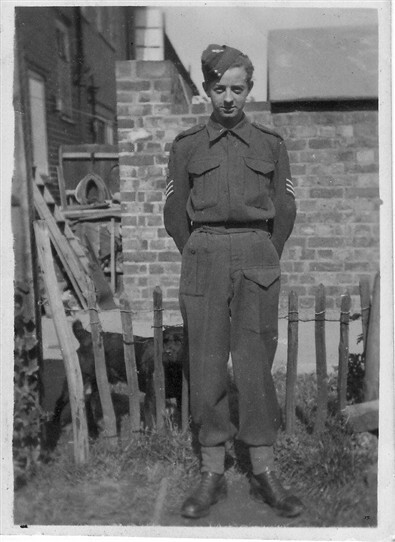 Gordon left the Cadets in 1944 to join the regular army and lost contact with the band. If anyone can help with information please add a comment or email us here on the website. This page was added by Beverley Walker on 08/09/2011. Hello there, I have two uncles in this photo. Bottom row 2nd in from the left is Albert (Bert) Webb and Bottom row 4th in from the right is George Wort. My Dad was also in this army band. There is another photo that exists that was published in the Sutton or Carshalton Guardian? Someone had posted it, in the hope of contacting some of its band members. I hope this helps. Kind regards Jan Davies (nee Webb) PS the Webbs and Worts lived in Welbeck Road. My Dad Alan Ward is in the middle row 5th from the left, he must have been about 16 years old. He later went to Egypt with the Surrey Regiment where I was born. Then came back to St Helier Avenue. Nice to see my mate, Bert Webb, in the photo. We were friends from age 7 till when he died. We were in school and the post office together. We got together fine. Good boxer and swimmer. Fond memories. We know the whole family well. We are still in touch with his son and daughter. I remember the band marching down the street with all the kids of the neighborhood following in step behind. My Nan lived there during the war years, Jane Pluckrose. She had 4 children Arthur, Norma, Shelia, Derek. My Grandad was (Popye) Arthur James and her Neighbour was Mrs Earl.